Paradigm Electronics, based in Ontario, Canada, has been building loudspeakers for over 25 years. 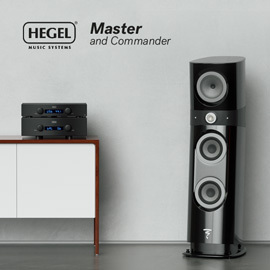 Since the beginning, the Monitor series has been Paradigm’s bread-and-butter line of speakers, but through the years, Paradigm has steadily pushed against its boundaries of price and performance, introducing first the Reference series and then the pinnacle of its loudspeaker technology, the Signature series. Mainstream consumers such as I benefit enormously from the trickle-down effect: many components and technologies developed for the Signature models eventually find their way into the Reference and Monitor lines. That trickle-down effect is also alive and well within the product lines of Anthem Electronics, now a division of Paradigm. The much-vaunted Anthem Room Correction (ARC) software was introduced in the Anthem Statement D2 A/V preamplifier-processor, which retailed for $7500 USD. 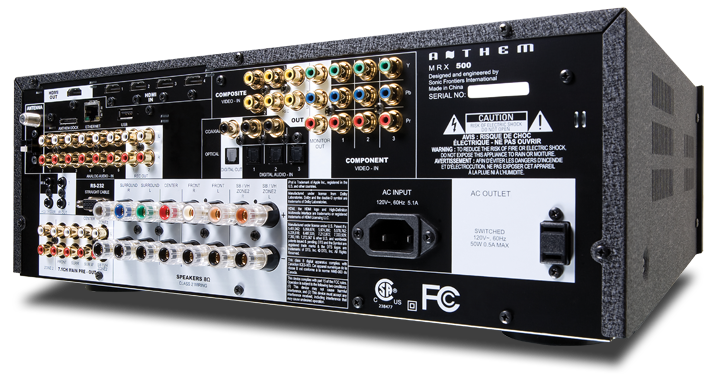 Now ARC appears in Anthem’s more affordable components -- including the audio/video receiver reviewed here, the MRX 500 ($1500). The Anthem MRX 500 sits in the middle of Anthem’s receiver line: below it is the MRX 300 ($1000), above it the MRX 700 ($2000). The main differences between the MRX 300 and MRX 500 are the power ratings -- 80Wx7 vs. 100Wx7, respectively -- and the inclusion in the MRX 500 of Internet Radio and the ability to play music from USB drives. 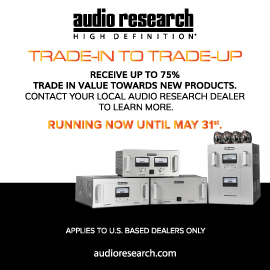 The MRX 700 offers 120Wx7, a toroidal transformer, and HD Radio. At 17.25"W x 6.5"H x 15.25"D and weighing 34.3 pounds, the MRX 500 is of average size and weight. The front panel is uncluttered, with a central blue LED display above a row of input selector buttons. A large volume knob is on the right, a navigation pad to the left. Behind a sliding panel are a headphone jack, a USB port, and composite-video and analog audio inputs. Around back are four HDMI inputs and one HDMI output, and the MRX 500 is now 3D-capable. An additional component HD output is provided, as well as a second USB port and an Ethernet jack for connecting to your computer network for Internet Radio access. There are seven pairs of high-quality speaker connectors, the sixth and seventh pairs assignable to Surround Back, Front Ceiling, or Zone 2 duties. A port labeled Anthem Dock is for an optional iPod connector. The Anthem graphic user interface is one of the best I’ve seen. Its easy-to-read, high-resolution fonts look as if taken from an Anthem brochure, right down to the white-on-red color scheme. The volume level is visible through the HDMI, a nice touch seldom seen in AVRs. The Anthem MRX 500 comes with two remote controls: a main one, and a credit-card-sized one for Zone 2. The main remote is a bit basic, but can be backlit with a push of a button. Memorize where that button is -- you’ll never see it in the dark! A few direct-access buttons would have been nice, such as for changing listening modes and switching ARC in and out. ARC is impressive for a room-correction system included in a receiver. Its calibration microphone isn’t the dime-store type that accompanies most receivers, and it’s shipped in a separate box from the MRX 500. The microphone is the size of a thick pen, is of apparent high quality, and connects via USB. In a nice touch, Anthem includes a mike stand, a tripod that ensures better positioning than no stand at all. A long RS-232 cable and a CD-ROM round out the ARC accessories. A CD-ROM? Yes, ARC requires the use of a computer for calculating the room-correction parameters, which are then uploaded to the MRX 500. Getting ARC up and running requires a bit more effort than plugging a microphone into the front of the receiver and pressing a button, as I’m used to doing with room-correction software. After installing ARC on my computer, I needed to run a cable (included) from my laptop to the serial connector on the rear of the MRX 500. If your computer, like mine, lacks an RS-232 port, you need a serial-port-to-USB adapter. You also need to run another USB cable (also included) from mike to computer. I initiated the setup routine on my computer and ARC ran a series of test signals -- a whipping sound -- through each speaker. (Make sure you’ve punched the correct number of speakers you have into the system; otherwise, the program will wait for any phantom speaker to respond.) A minimum of five listening/mike positions must be tested, with a maximum of ten. It took me half an hour to run through five cycles of measuring five speakers and two subwoofers. The huge benefit of the ARC system over others I’ve used, including Audyssey and Yamaha’s YPAO, is that you’re shown, on your computer screen, a graphical representation of the frequency response (FR) of your speakers in your room. Anthem’s ideal FR is then plotted over your actual FR. The ideal FR shows a slight room-induced hump in the 70-300Hz range; according to Anthem, if this bass hump isn’t present, the speakers will sound too lean (read: bass-shy). A corrected FR is then calculated and plotted over the actual and ideal graphs. With this information, you can see how much the ARC is correcting, and how close you’re getting to the ideal curve. These graphical representations are a huge benefit to a reviewer evaluating components, and make the MRX 500 a special piece of home-theater gear. With most other room-correction programs, you have no idea what the program is doing or how the FR is being altered. Additionally with ARC, you have some control over room gain and bass-cutoff frequencies, so you can tailor the sound somewhat to your liking. ARC affects only frequencies below 5kHz, so the essential sound of your speakers is not completely altered. If that’s not enough calibration for you, you can also run two different room corrections, labeled Movie and Music. I ended up setting up the Movie correction to include my subwoofers, and to run my main speakers down to 60Hz. For Music, I kept my main speakers full-range and didn’t use the subs. Another killer feature is ARC’s Quick Measure. This lets you ideally position each speaker before you run the room-correction parameters. 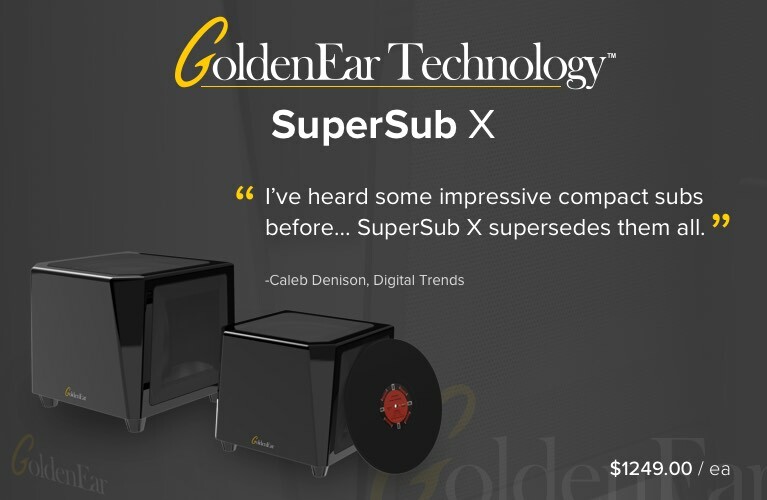 Ever wonder if you should toe in your speakers, or if your subwoofer would sound better in another location? With Quick Measure, you’ll soon know. Was all this complication worth it? In a word -- yes. I think an obscenity would be appropriate right now to emphasize how great the sound of my system was with Anthem Room Correction, but my editor wouldn’t be pleased with me. And I hate to make a point with hyperbole, but in this case it’s justified. What I heard with ARC active was better imaging, lack of grain, less fatiguing sound, and a more even bass response. In short, ARC had the effect of upgrading my speakers to sound like much more expensive speakers. And I’d hooked up the Anthem MRX 500 to some very good-sounding speakers: Monitor Audio Silver RX6 floorstanders, RX center channel, RXFX surrounds, and two Definitive Technology SuperCube II subwoofers. With ARC engaged, I could play this system louder without distortion than ever before. Some of my best-sounding recordings are CDs and SACDs by Patricia Barber. I spent hours listening to these, turning ARC on and off to hear how it affected the sound. "Ode to Billy Joe," from Barber’s Café Blue (CD, Premonition/Blue Note 21810 2), has finger snaps throughout. With ARC on, each snap sounded more distinct and less veiled than without ARC. Michael Arnopol’s double-bass notes were also much tighter, with much less room resonance obscuring the music. I heard a good example of the MRX 500’s imaging prowess with ARC when I played Norah Jones’ live version of "Crazy," the other track on "Turn Me On" (CD single, Blue Note 53475). Jones’s voice is focused dead-center, with piano to the left and guitar to the right. I’m not saying that the guitar suddenly appears on the wrong side without ARC, but the imaging was fuzzy and seemed to extend higher than it should, with Jones’s voice originating 8’ off the ground. ARC snapped the imaging into a centered plane near the tweeter height -- which was the correct placement. A great disc for testing whether or not the bass sounds right is Holly Cole’s Temptation (CD, Alert Z2-81026). Speakers and subwoofers often overemphasize the bass in "Train Song," which can easily turn into boominess. I confess to liking this boominess for action movies, but it makes bass-laden music tracks fatiguing to listen to. The ARC system in the MRX 500 made all that booming go away. Occasionally, with ARC active, I thought it sounded a bit too lean, but after fiddling with the subwoofer level for a while, I usually returned it to where ARC had originally set it. 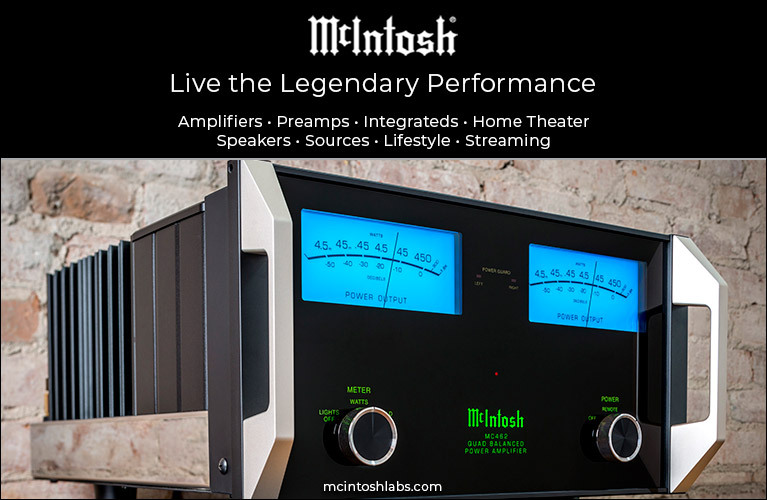 I would be remiss if I didn’t mention how the Anthem MRX 500 performed in a home theater. Another "Wow!" and expletive followed when I watched the Blu-ray edition of Master and Commander: The Far Side of the World. With ARC on, the bass response was tighter in the opening battle scene, and dialogue intelligibility was also improved. With ARC taking the room out of the listening experience, it was easier to crank the system loud and get immersed in the movie. When I thought about what a great job ARC was doing, I concluded that it had to be my room’s problems that made me so like the software’s action. My home-theater room has hard drywall surfaces, no carpeting, and no furnishings other than a few bookshelves, a sofa, and a loveseat. In short, it’s a reflective space, and thus an ideal candidate for ARC to make a significant difference. If your room has bass traps, sound absorbers, and other deadening devices, ARC may not do as much for its sound. But if you want to use such devices, ARC’s Quick Measure feature will help you find their optimal positions and orientations. I can think of a couple of receivers that would challenge the Anthem MRX 500 in terms of features and sound: Cambridge Audio’s Azur 650R ($1500) and my longtime reference, the Integra DTR-8.8 ($2400). Like the MRX 500, the Integra DTR-8.8 includes room-correction software (Audyssey’s MultEQ XT), along with Internet Radio and MP3 playback. The Integra’s most significant advantage over the Anthem is that it can directly read SACD’s native DSD bitstream (the Anthem converts these to PCM). Despite this, the improvements that ARC made in the sound in my room were more significant than the resolution deficiency of PCM. For example, the sound of Patricia Barber’s piano in "Bye Bye Blackbird," from her Nightclub (SACD, Mobile Fidelity Sound Lab UDSACD 2004), sounded more realistic through the Anthem than through the Integra. In my review of the Cambridge Audio 650R on SoundStage! Xperience, I proclaimed it one of the best AVRs I have used, and lauded its transparency. I would still make that statement in a comparison of the 650R with the Anthem MRX 500 with ARC turned off. However, ARC took the Anthem a notch higher, diminishing room distortion, which resulted in a big increase in resolution over the Cambridge. When I first fired up the Anthem MRX 500, I thought it a good receiver with a great pedigree, from a company that has produced highly regarded surround-sound processors. After setting up and using its built-in Anthem Room Correction, I think the MRX 500 is a fantastic receiver worth every penny of its price. Even if Anthem charged twice as much for the MRX 500, I would still think the price fair -- because of ARC. The fact that the MRX 500 lists for only $1500 makes it a genuine bargain among home-theater receivers, and therefore the one to get. Warranty: Three years parts and labor (one year for remotes).